Western Disturbance to bring cool winds! Lahore cools up – Karachi remains dry! *Western disturbance ’04’ could affect the extreme northern areas of the country. *Dissipating high pressure over northern Arabian sea. *Low pressure could form in the south-east Arabian sea. 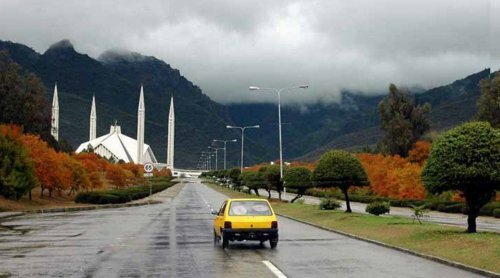 Western disturbance ’04’ coming – Misses Islamabad? In the month of October, three weak western disturbance affected the northern areas of the country that brought light showers with strong winds. Circulation over Iran also bring drizzle along with fast winds in lower Balochistan and western Sindh. These disturbance played major role in lowering the temperatures of the country especially the night temperature. A fresh western wave ’04’ could affect the extreme northern areas of the country during the last week of October/first week of November. Peshawar, Lahore, Gujranwala and Islamabad could experience some passing clouds during this period, these cities are under the influence of weak cool winds coming from Afghanistan especially during the night. During the second week of November there are chances that western disturbance 05 could affect many parts of the country including lower parts, with the cool winds would also increase, only one model agrees on this scenario at the moment. Karachi had been under the influence of dry western winds coming from Balochistan as the sea breeze has been cut off since the start of the month, dry winds (land) coming from Balochistan will get cooler during the middle/end of November. Karachi’s night temperature has dropped as compared to the day’s temperature. When will it rain in Karachi? Well, Not anytime soon! PWP would issue its Winter: First Outlook in November while a Second Outlook in January. Tropical Activity: Western power changes it all! Western disturbance ’04’ has caused the expected tropical activity in the south-east Arabian sea to remain at the Indian coast hence it has favoured the Bay of Bengal’s system to intensify into an expected cyclonic storm ‘Nilam’ (at the moment it is a depression – October 28). PWP on October 22 did say that there were 100% chance of depression BOB 02 to form and on October 28 a depression did form in the Bay of Bengal. The Arabian sea low pressure could still intensify into a minimal depression however it would face great difficulty in its life time and would be forced to move in over the western coast of India excluding Gujarat. Both these tropical depressions (Arabian sea and Bay of Bengal) would bring widespread rainfall to central and eastern parts of India, later the remnants of these storms could move towards Bangladesh in a NNE direction. PWP had been giving special coverage to Bay of Bengal’s system since October 24 on Bay of Bengal’s system since October 24!, PWP may start a coverage for the Arabian sea system on the same link. Its November but weather is still quite warm at peak times(31 C here in Lahore) When will cool winds start penetrating Pakistan and temperatures would become lower?